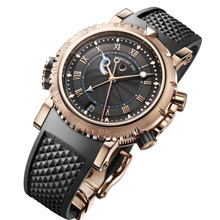 Breguet’s Marine Royale 5847 comes with an alarm device that can only delight both amateur divers and aficionados of exceptional complications. Underwater tests confirm that sound travels better through water than through air. Sound waves require material support and their speed increases with the density of the environment. Sound travels about four times faster under than above water. Furthermore, as the underwater milieu is generally far less noisy than the aerial one, the alarm’s sound is perceived with greater clarity underwater. The alarm setting crown and on-off pushpiece, in gold, are sheathed in rubber for easier handling, adding a further touch of sporty elegance. The watch naturally possesses the usual diver’s -watch features, not least a one -way rotating bezel and luminous markers. The bezel’s unidirectional rotation is secured by a blocking pawl, visible and located between the two winding crowns on the case flank. Shaped like a wave, it recalls the watch’s essential functions. To improve its legibility even in the murkiest waters, its minute markers and hand along with the hour hand are coated with white luminous superluminova while the alarm markers glow blue. Represented by a blue triangular pointer at 10 o’clock, the alarm’s power-reserve indicator is also luminous. Rounding out its attributes, the Marine Royale 5847 possesses a date indicator and a self -winding mechanism. Two versions are available : white or pink gold cases, with an 18 kt gold dial with black rhodium finish. Both are manually engine-turned with the collection’s dedicated wave pattern. sheathed in black rubber. Screw-locked crowns. Water-resistant to 30 bar (300m). 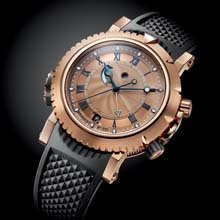 Dial: 18K gold with black rhodium finish, displaying a wave pattern manually engraved on a rose engine. Individually numbered and signed BREGUET. Chapter ring with applied pink gilt Roman numerals and luminous dots. Triangular hand at the center for setting the alarm time. Alarm power -reserve indication in an aperture between 9 and 11 o’clock. Alarm on/off indicator in a round aperture at 12 o’clock . Date at 6 o’clock. Facetted, open-tipped BREGUET hands in 18-carat gold, coated with a luminous compound. Movement: self-winding mechanical, with alarm mechanism, numbered and signed BREGUET. Cal. 519R. 12 lines, 36 jewels. 45-hour power-reserve. Engine-turned 18K rose gold rotor. Frequency 4 Hz. Straight -line lever escapement. Balance-wheel with regulating screws. Adjusted in 5 positions. Rubber strap. Also available in 18K white gold and with a leather strap.